Southland Times cycling writer Scott Donaldson talks to 19-year-old Nick Kergozou before the 2016 Oceania Track Cycling Championships in Invercargill. Which events will you be involved in? Team pursuit, omnium and the madison. I have been riding now for eight years which is crazy to comprehend. From a young novice to now being an elite member of the New Zealand track cycling team, it is all mind blowing. It's exciting to think what the future has in store for me. What are your best career results so far? Last year was an extremely successful year for me coming off my Junior World Championship campaign into the elite scene. Having my first elite track nationals and riding a 1:01.9 in the 1000m time trial which is a world class time, would be my best result to date. Also riding a 4:29 individual pursuit was a highlight. Winning the tier one omnium in Dublin this year and having many great results on the road in Belgium. This year is going to be extremely exciting as the Oceania Championships will be my first big event leading into the World Cup season and track nationals next year. How have you gone in recent events in the lead up to the Oceania Champs? In Belgium I rode two track events one in Czech Republic and the other in Dublin, Ireland. The Czech Republic was a good first hitout and I came away with the win in the flying lap and kilo (1000m time trial). I placed fifth overall in the omnium. Ireland was very successful coming away with the win and some great times on a 460m concrete outdoor track. 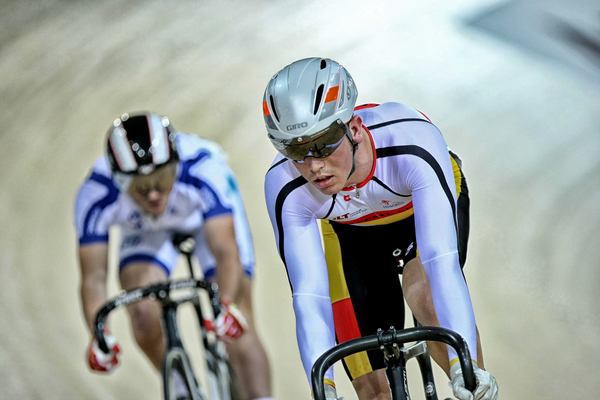 Kerzgozou also produced a promising performance at the national omnium championship last month, winning several events. What are you hoping to achieve from the Oceania Championships? It's going to be great to ride with the likes of Hayden Roulston who is returning from the road as a pro rider riding for Trek Factory Racing. He has had great success on the track and now it's exciting to see him bringing back his expertise for the team. My goals from the Oceania Championships will be focusing on team success in the team pursuit and madison alongside individual success in the omnium. A lot of hard work and pain is the key. I've done the hard yards on the road from the start of the year to now and it's time to transfer all that on to the track. It's now fine tweaking the body to be able to perform at my best. What are your aims over the next year and how will the Oceania Championships fit into this? As Rio is around the corner next year I am really wanting to show what I can do this year and the Oceania Championships will be the start. They will set myself and the team up for the World Cup season. Have you raced in the Oceania Championships before and how did you go? My last Oceania Championships were when I was under-19. I had a successful time coming away with the 1000m time trial title, silver in the sprints and third in the scratch race. I was actually a sprinter back then and then transitioned into the endurance side. What are you looking forward to the most about the Oceania Championships? It is always great to come home and race in front of a home crowd. I really can't remember last time I rode at the Invercargill track so it's going to be extremely exciting to come and race with such a great team where it all started for me. It sounds like a strong Australian team is coming, so the racing is going to be exciting for riders and the public. Where are you usually based? I am now based in Cambridge. I still call Invercargill home but I am enjoying the change into an elite sports environment. I love coming home and enjoying the outdoors. There are not many places as unique as Southland. What will it be like for you to ride in Southland? Catching up with family and friends while racing will be great. It will also be awesome to have a packed SIT Velodrome full of Southland supporters.